Shackles for Les Miserables 2012, close up. Missed this one! Well I did until today, I’ve just realised we made props for the award winning Les Miserables film and didn’t shout about our involvement, we were so busy in 2012 I totally forgot we had done our bit toward the film’s success. 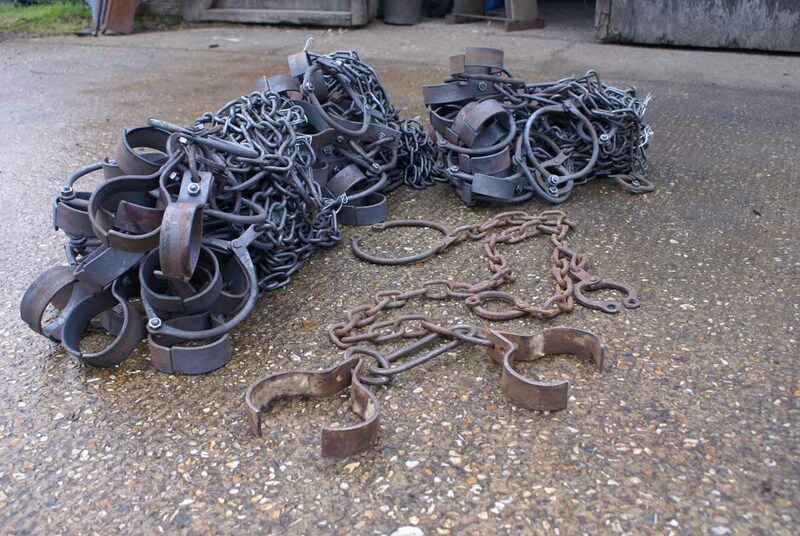 Barricade Productions approached us regarding a particular scene where they needed a large quantity of authentic ‘slave’ shackles. We had worked with some of their production staff on other films, so were recommended as a safe pair of hands. I have a big problem with anything to do with the word ‘slave’. As a professional, 21st century Smith I don’t do restraint items, arms or weapons (including knives). Barricade were quick to clarify that this was the only description that fitted what they had in mind, the metalwork was to be used in a set dressing context. The production company was hiring Pinewood Studio’s water tank set for the scene (a big deal apparently, James Bond movie’s use it a lot!) and to boot it had Russell Crowe as the baddie ‘Javert’; he’s my wife’s favorite, so I had to take on the commission. In the scene, Hugh Jackman’s ‘Jean Valijean’ lead charachter fights his way on to a dry land, weighed down by his chain restraints, having survived a landing from a stricken ship. Following are many ‘lost souls’ in a similar predicament. 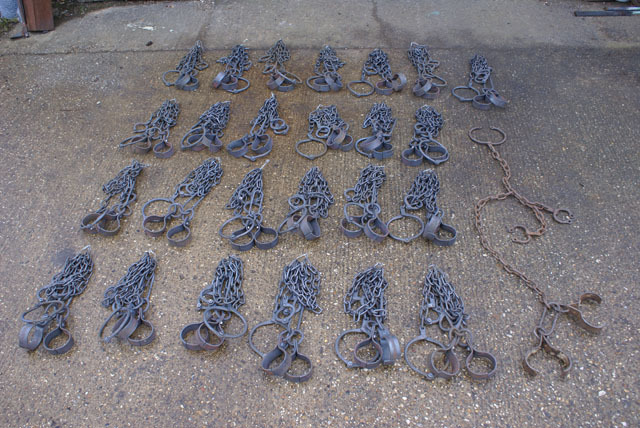 Twenty five sets of bindings/cuffs/shackles were needed for the professional actors. We had made some for the ITV series of ‘Sharp’ in the 90’s starring my favorite actor Sean Bean, so twenty + sets was no problem. As usual budget was a problem, but we managed to deliver accurate copies of the production companies historic sample. Burrows Lea Forge’s blacksmiths turned round the order for 25 sets within 2 weeks of the order being placed and on budget. That’s pretty good as Movie work goes. Especially as we were making pieces for Walt Disney’s ‘Malificent’ at the same time.Thanks to Mick, his industrial Smithing expertise did us proud on this one (as he always does). Les Miserables shackles 25No. copying exactly Barricade Production’s original on right.